As Kieron Gillen once said, gaming’s dark secret is that occasionally watching a number slowly increase is enough. It’s that slot machine trick, where being rewarded fires off all the dopamine receptors in your brain, until you start to associate the reward response with the activity. If the reward is variable, it makes the association even stronger. Sometimes this scares me (when it’s paired with microtransactions I think the technique can be downright unethical), but a lot of the time a good, enjoyable RPG grind is exactly the kind of mindless fun you need to keep yourself busy and while your brain relaxes. I know I already said this to you in response, but I want anyone else who sees this to read what I have to say. Oblivion is already a good game, but what really pushes it over the edge into a great game is the number of amazing and massive mods that fix a lot of its flaws. 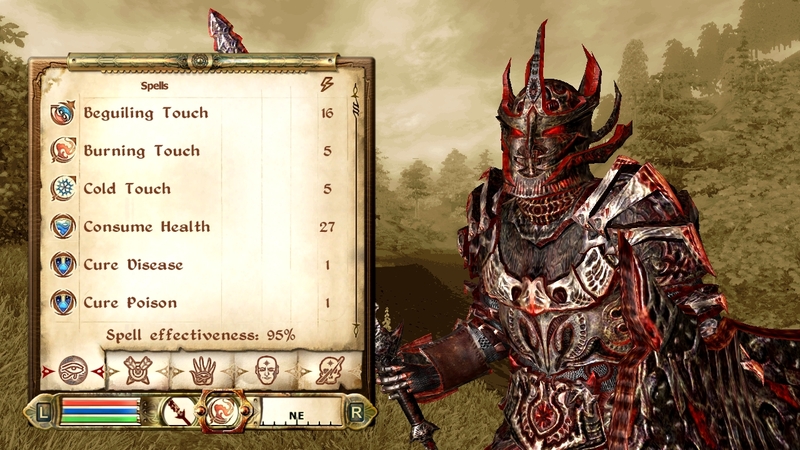 For example, there is a mod called Oscuro’s Oblivion Overhaul, which eliminates the level scaling and, in that sense, returns everything to Morrowind. It actually does a lot more than that — it adds a huge amount of new content, and the “we’re going to place enemy X here at this level” is done with scientific rigor. (Note: Oscuro is now a professional game developer.) The end result is something that has eliminated many people’s complaint about Oblivion, all while adding a significant amount to the game at the same time. Similarly for leveling up and stats, there’s a lot to choose here. I hated the idea of “okay now I have to raise skill X and Y and…” even when I was playing Morrowind, and just wanted to play the damn game already. There’s a mod for Morrowind that lets me do that; and there’s a *series* of different mods for Oblivion that do that depending on your taste — check out nGCD + Progress. I’m aware this doesn’t really address the point of your article, but I don’t want anyone to come away thinking that Oblivion can’t be different. I’ve seen many people who feel pretty much the same about Oblivion as you do. It seems to be the most common view on the Internet, in fact, to judge by comments on blog posts, and it’s made a lot of people hate the game. I played Oblivion when it came out. It was my father’s copy, on his PC (mine was too old to run it); we both played uncounted hours of it. We – independently, but talking to each-other about our adventures – wandered all across the wild fields of Oblivion, plundering dungeons, completing quests, leveling whenever we got the chance. I’d heard of people who optimized in the way you did; read snippets of strategy guides that advised you on how to get ‘perfect level-ups’; and my father and I both laughed at them. What a ridiculous thing to do! We couldn’t imagine anyone playing that way. Why would you, when the game was so much fun playing it as it was clearly intended to be? I suppose it’s seeing the numbers, again; except that I saw the numbers, and turned away. Can’t say I regret it, either. I haven’t played Oblivion and your words make me… not want to. I’ll keep it on my list of “One Day…”, because I like explorable environments, which is why I’m hooked on FUEL at the moment. Still, this sounds like the twisted, evil brother of Laura’s Expertise piece. And when I mean twisted, I mean the one that tortured caterpillars and dogs for kicks in their youth. Um, mods? The three I mentioned completely change the way the game is played — entirely eliminating the “expertise” aspects. I’m strangely purist. Even back when games were impossible in the 80s, I was loathe to apply cheats, even when I trawled through the machine code for 3 hours to find the correct LDA #$03 instruction which set the lives to 3. Mods are, of course, not cheats, but I have a certain masochistic attitude to want to play the games as released (as “intended” is not appropriate, because that’s a whole sackful of writhing caterpillars waiting to be unleashed). I don’t know why this is. I have played mods of course – I played the System Shock 2 with the Rebirth skins, and I’ve dallied with a number of Thief FMs, Thief 1 & 2 being pretty much my awesome forever games of all time. It’s probably mainly due to time, these days, and a fascination with the newest shiny on the street. It’s only in the past few years I have forgone playing [unfun] games to completion. Previously, I would not start a new game until I had vanquished the last level – I’d paid for all the textures and code, I wanted to see all of it in action, too. Hmm, this is giving me an idea for some wordage. Oblivion is a good game that is worth checking out. It also made me crazy. If you can play it like PleasingFungus, power to you! If you can’t, mods are a good idea. If you really like pushing the same button over and over again, to each his/her own. For the record, I wrote this way before Laura wrote Expertise! And some caterpillars deserve to die. But seriously I do enjoy playing the stats game sometimes. I must on some level anyways, ’cause I keep coming back. Also I’m a vegetarian. It was clear your post was not intended to be linked to Laura’s but I couldn’t help but see the connection between them – learning certain methods that game the game, that are progress with numbers, above and beyond what would be taken for “casual” play. A rubber band strapped to your 360 controller is just abnormal behaviour. Not as bad as strapping a rubber to the controller, but not far off. And I speak as a vegetarian of nearly 20 years! 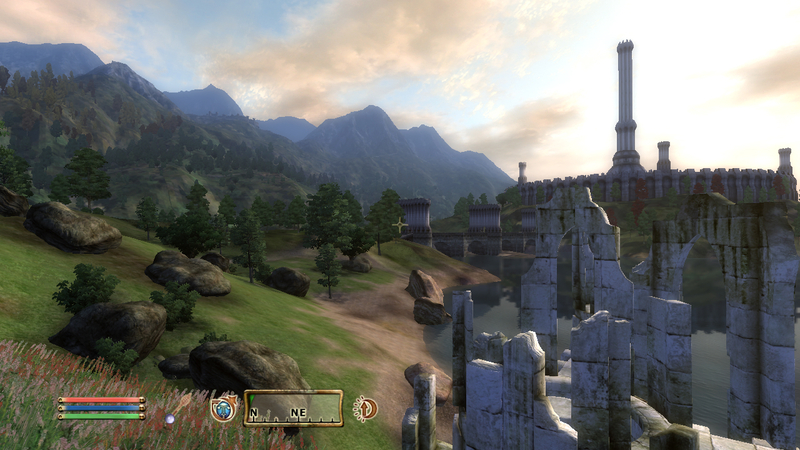 I don’t have the experience of Morrowind to compare, but my time with Oblivion was nothing like what you’ve described. Everything felt fairly intuitive to me (although the major skills thing was a little stupid). 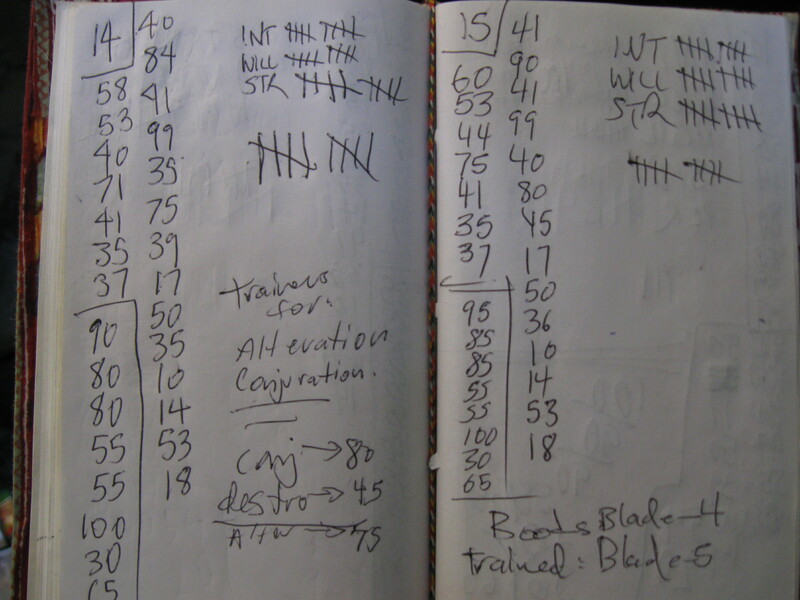 I never saw any need to peruse a wiki, pick apart stats, or—God forbid—scribble in a notebook to figure out a leveling plan. Maybe you had the difficulty cranked up? Maybe the Xbox version is just weird? Or maybe it’s because you weren’t playing a mage…people tell me that life’s hard for a pimp fighter. I’m not saying you’re wrong about anything, but you might want to give the game another stab. Don’t bother min-maxing, just go with it; I think you’ll find a very different experience. And seriously—play a mage. Yeah– I just play Oblivion however I please, and I never find it TOO difficult– but I must agree, playing a fighter is tough. I usually go for the sneaky thief route and that can get very wearisome after a short while. After all of that brain-numbing button pushing, my character is essentially invincible. I have 100 Strength, Endurance, Intelligence, and Willpower. My Speed and Agility are at 90 and my Luck is at 65 (Personality is useless). I have most of the useful stats maxed. I’m the head of lots of guilds, but there is still more stuff to do. I haven’t given up on Oblivion! It is a very fun game when I’m actually playing it. I’m particularly enjoying the assassin’s guild quests. You should go play Morrowind. It’s awesome. I like these articles, can’t believe it took me this long to find this place. You guys have gained an avid reader! Thank you Sir Muffin Man! You are most welcome here.